Today, I uploaded a scan taken earlier and it took about 3 hours for processing 100 Scans and producing the Showcase. I checked it out and I noticed I had to adjust some trim points to clean it up. I adjusted them and re-uploaded. It's now been 8 hours and it continues to say processing. I normally don't keep track of how long it takes but this seems weird. Has anyone experienced this? also, what's your typical processing time? I've had some go quick (an hour) and some take overnight, even with similar number of scans. I guess it depends on the servers workload at the time. I uploaded one the other day (200+ scans) that took 24 hours to complete. I guess it depends on how busy their servers are. @Jamie , I think that's a great Idea, but it seems that MP is trying to maintain total control. @Glenda , I don't usually keep track because I'll scan and upload and then wait about 24 hours, but I needed it faster today. BTW, 13 hours and counting . 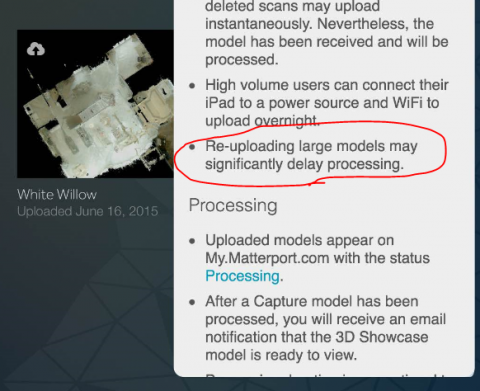 Maybe we could ask Matterport to try to give a processing status icon on our Models page. Those things are never super reliable, but it might at least give some indication of how much time was left for a job we were waiting for. So, it took 16 hours to process, thankfully within the time promised. I just added it to the appropriate Wish List. I've noticed over the last week that its taking considerably longer for scans to come back... not ideal if your in a hurry! I'm having a similar issue. I re-uploaded my model after making some adjustments and it has been processing for about 11 hours now. I read somewhere that re-uploading larger models may significantly delay processing. I contacted matterport support, but I wonder if it just has to run its course. After 12 hours of processing and emailing/calling Matterport, my model is complete! Weird part is, I didn't receive an email saying that the model is ready to view. Oh well. When it doubt, reach out.. to Matterport.